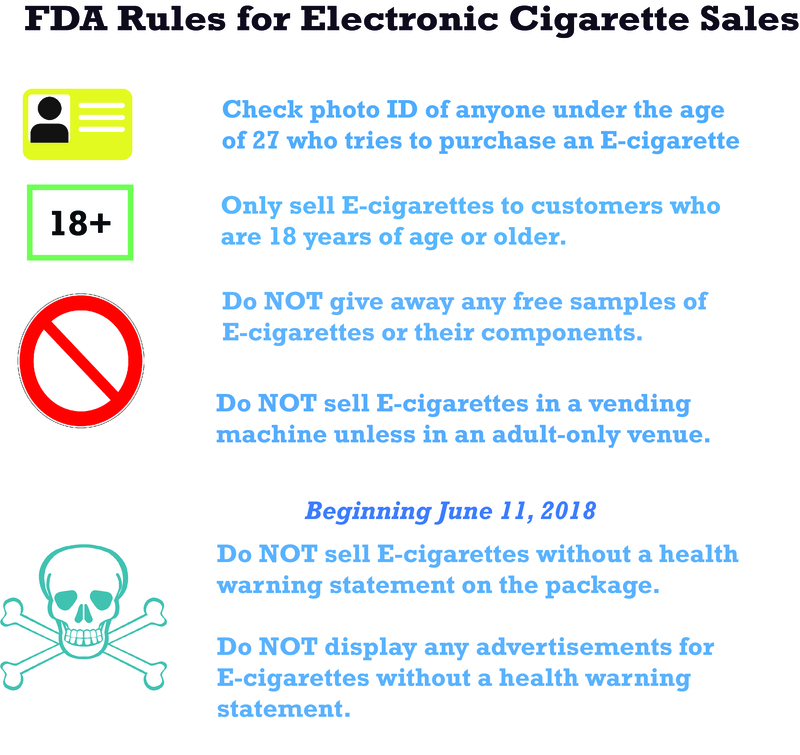 This page contains details about the CATCH My Breath program, videos, tip/fact sheets, a social media site, and background information on E-cigarettes. If you have any questions please contact us at [email protected]. You can stay informed with email updates and Stand with CATCH My Breath - sign up here. Help your community stay informed about e-cigarettes by hosting an educational presentation. We offer a video and downloadable PowerPoint slides as a self-serve option, otherwise webinar or in-person presentations directly from our CATCH My Breath staff. Learn about all the options here. This handout covers general program info and answers questions like "What will students learn?" 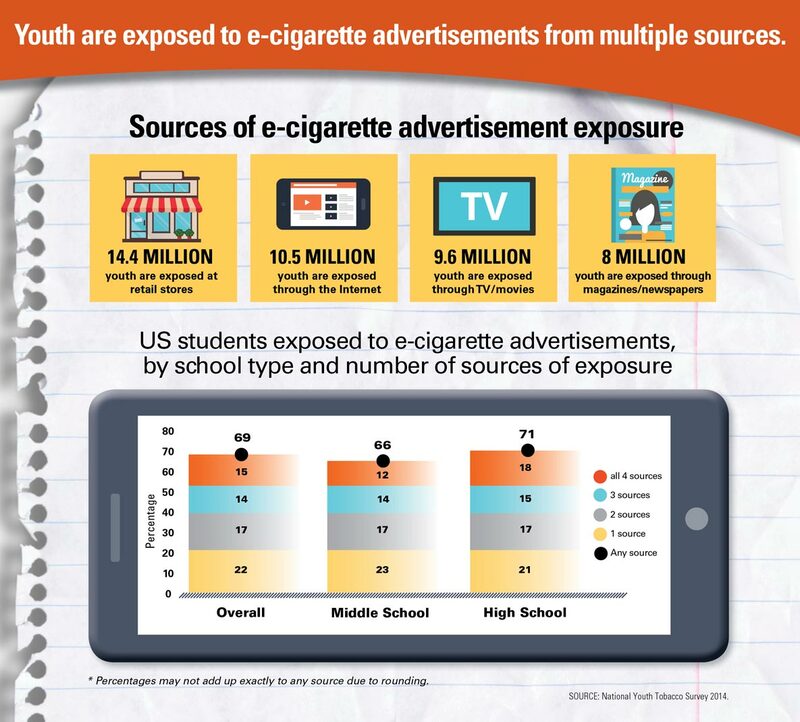 and "Why is E-cigarette education needed?" 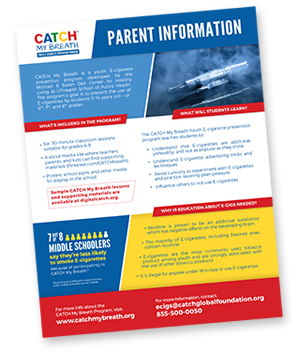 Provides parents and teachers with basic information about e-cigarettes and JUUL, and explains how CATCH My Breath can help schools. Want to give this presentation in your school or community? The PowerPoint presentation is available to download here and includes a slide-by-slide script in the slide notes. 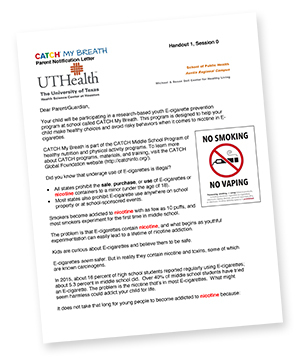 These fact sheets are intended to help you talk about E-cigarettes with your teen. The basic components of an E-cigarette (aka vape pen) are a cartridge containing a nicotine solution, a heating element that aerosolizes the solution, and a power source for the heating element, which is usually a rechargeable lithium battery. E-cigarette appearance can vary. Some devices, like JUUL, look more like a USB device than an E-cigarette. E-cigarettes can be purchased in several concentrations of nicotine, many which are equal to or higher than the nicotine content in conventional cigarettes. 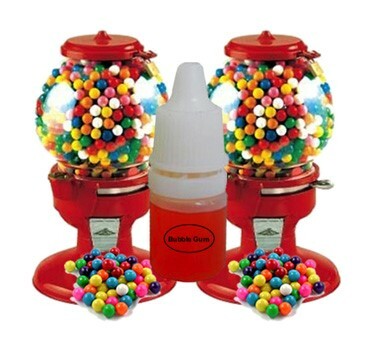 E-cigarettes deliver nicotine through a liquid (called E-juice) consisting of glycerin and/or propylene glycol, as well as flavoring chemicals such as fruit, bubble gum, and other flavors that are very attractive to youth. What does an E-cigarette look like? 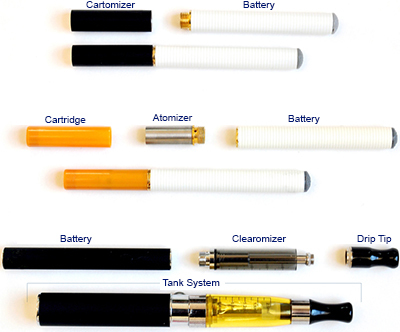 E-cigarettes can take on many different shapes and forms and they can vary in name. Today, E-cigarettes include brands such as PHIX, MY.VON ERL, My Jet, PULSE, Bo One, Suorin Air, Vapor Fi, and JUUL. 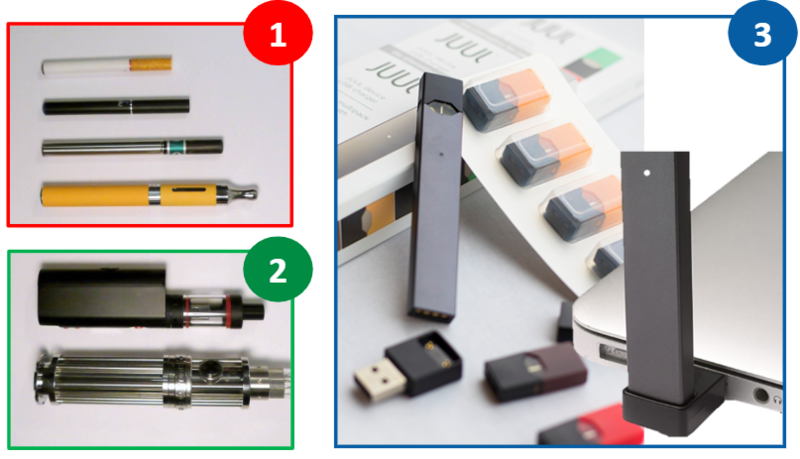 Below you can see examples of disposable e-cigarettes (1), reusable "tanks" (2) and JUULs (3). Although there are a lot of E-cigarette options available, JUUL is a brand making small E-cigarette devices that resembles a USB device more so than an E-cigarette. This E-cigarette is growing in popularity among youth and can be referred to as a verb, JUULing, which is vaping using a JUUL device. E-cigarettes are a source of extremely high doses of ultrafine particles in the human respiratory system. These particles have been linked to cardiovascular disease. Nicotine is much more addictive to the immature teen brain compared to the developed adult brain. Even a little nicotine can lead to ADHD-like symptoms and compulsive behavior, which can contribute to classroom behavior problems. There is some evidence that nicotine primes the brain for other drug addictions. Nicotine is extremely harmful to the developing fetus. There is no known safe level of nicotine exposure in utero. Drinking nicotine in E-juice is harmful and possibly fatal for babies and toddlers. Nicotine overdose symptoms include rapid heart rate, nausea, elevated blood pressure, vomiting, diarrhea, dizziness, convulsion, and potentially seizure and death. The process of heating the nicotine solution produces aldehyde, acetaldehyde, formaldehyde, and acrolein, which are known carcinogens. The glycerin/propylene glycol and 8,000+ flavoring chemicals in E-cigs have only been approved for ingestion (eating). It is not recommended by the manufacturers that these chemicals be inhaled, as they have not been widely tested for their potential sensitizing, toxic, or irritating characteristics. Many E-liquids are custom-mixed by individuals at home, increasing the potential for additional health risks to E-cigarette users. Even commercial E-liquids are produced with unknown manufacturing procedures, packaging materials, and purity standards. How common is E-cigarette use? As of 2018, 11.7% of high school students and 3.3% of middle school students across the U.S. have used E-cigarettes in the past 30 days. 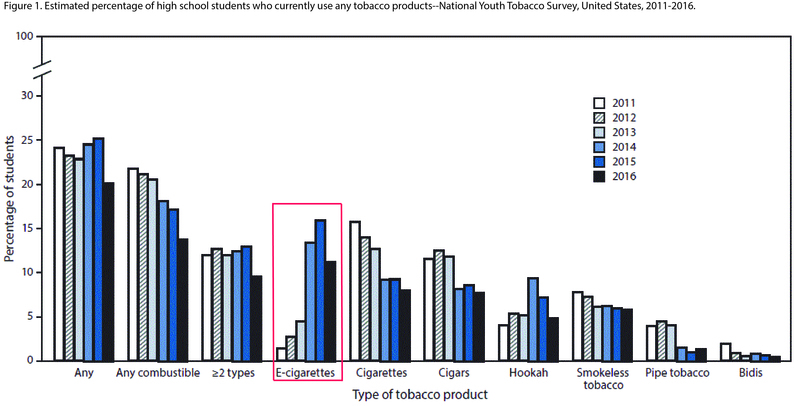 In some states over 40% of middle school kids have tried an E-cigarette at least once (over 50% in high school). This data points to the fact that large numbers of American children will become addicted to nicotine and are at risk for becoming a regular tobacco user.